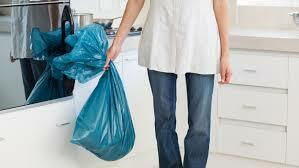 Trash bag makers are hoping shoppers will follow their noses to their latest products. Glad Products Co. is gradually increasing its selection of bags that feature technology which promises to block odors, after introducing a line of bags called Odorshield with Febreze, the household odor eliminator, last year. Competitor Hefty is also increasing its offering of bags that use its Odor Block technology, but betting many consumers will prefer its unscented version. In April, Simplehuman introduced its first odor-control bags using carbon-lined plastic it says absorbs odors. Even trash can companies are innovating around odor. Simplehuman LLC added carbon cartridges to its newest trash cans. And iTouchless Housewares & Products Inc. is putting them into its newest hands-free sensor trash cans that open automatically. It’s a lot of high-tech innovation for one of the home’s humblest products and an item intended to be immediately thrown out. In a poll, 76% of Americans say that trash is the smelliest thing in the house, ranking ahead of pets, shoes, husbands and kids, according to a 2010 survey done by Glad, a unit of Clorox Co. Baby diapers are the worst offenders, followed by spoiled refrigerator food. Amanda Kogut freezes her garbage before throwing it away. The 34-year-old business analyst at a nonprofit employment agency in New York, says it is better than putting smelly things like fish or meat in the trash to sit for days.